Notes on what the part is for and other information. GLUE: Use regular PVC glue. Primer not needed. To activate your VacPan simply direct the foot switch to the on position, sweep dirt and debris toward the powerful suction of your VacPan (powered by your central vacuum), and you floor is clean - instantly! When your sweeping is complete, just use your foot to turn off the VacPan suction power, automatically closing the valve. White, Black or Almond. Please specify. Other colours available, please ask. Flex Pipe is excellent for installing VacPan automatic dustpans. 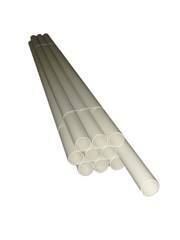 Central Vacuum 2" OD PVC pipe fits snugly into this flexible pipe that is 2" ID. Use a Hose Clamp for Flex Pipe for best connection, do not glue. Not recommended as a replacement for rigid pipe. Similar to VacPan but with pipe connector on rear instead of top. Contains low voltage connections only. There are two metal contact points inside the hole of the valve. Can be installed to open up or down. Contains low voltage connections only. There are two metal contact points inside the hole of the valve. Metal inlets are recommended for decoration, outdoors, or in the floor. As above (M653HMB) in Chrome. Suitable for all of the above inlets. For new construction nail it to a stud. When piping, connect a fitting such as a tight 90 or coupling to the flange. Finish it with a basic inlet valve cover. 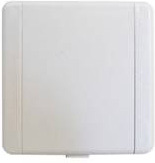 This low voltage valve is 3.5 inches square with screw holes at 2 and 7 o'clock 2.25 inches apart. There are two metal contact points inside the hole of the valve. Other colours available, please ask. Backing Plate used for square 654C Series Inlet Valve Covers. Nutone vacuum inlet / outlet replacement. SIZE: 3-3/4" wide by 3-1/4" tall. NOTE: USE NUTONE BACKING PLATE. Backplate for NuTone inlet M653NW. PVC Pipe for vacuum connection through property. Price per 1 Metre length. Use as many of these as needed when the wall, for any reason, is too thick causing the mounting plate and finished plate to not meet. Longer screws will be needed as well. It adds 3/4 of an inch to the coverplate. If that is too much you can cut to size. Goes only on the mounting plate (that the inlet cover attaches to). It will be the tightest turn in the system and therefore catch anything long and stiff right at the inlet valve. 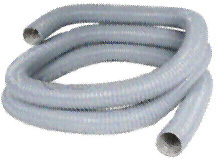 The most used fitting for routing vac pipe around corners. The Sweep Ell has a more gradual 90 degree turn than the Tight 90 and should be used instead of the Tight 90 where ever possible. One end of a spigot fitting fits into another fitting. Great for tight spaces. Use these for offsets and thus use less Sweep 90's. One end of a spigot fitting fits into another fitting. Great for tight spaces and for offsets. Here is a plumber's secret - a regular 45 and a spigot 45 together can make any angle. Pipe straps are used most often under homes, in basements, and when pipe is exposed in closets on some existing home installations. Visit us on Facebook for the latest news.